Tibetan Experience - Trips inside Tibet itself cannot be booked definitely until your arrival in Nepal; the Chinese Government changes policies at short notice, and visas have to be obtained, which usually take 4 days. We can organise trips within Nepal, centred around the Tibetans living in exile here, but including a flavour of Nepali life and sights too. The way it will work is that you book your flight to Kathmandu and we arrange the rest. The programme from Kathmandu is 10 days and includes your internal flights to and from Pokhara, accommodation at Tibet Guest House in Kathmandu and at Peace Dragon Lodge in Pokhara, and all trips to at least 4 Tibetan Refugee Camps, various monasteries and other places of interest. The minimum group size is usually 4 persons. IF YOU ARE INTERESTED IN US ARRANGING A TRIP SPECIFICALLY FOR YOUR OWN FAMILY OR GROUP OF FRIENDS, PLEASE CONTACT US. See navigation bars at top of page. 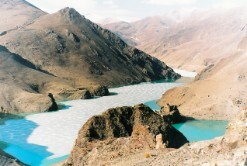 We can also usually arrange a trip into Tibet, at the end of your stay in Nepal. 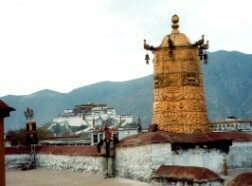 Four days is a minimum length of time to allow for your journey to Lhasa. Please enquire for details and prices as they vary according to whether you travel overland or by air. Drive in/fly out is another option, but allow 6/7 days for this. Travelling up to Lhasa overland allows you aclimatise to the altitude and you experience Tibetan rural life en route, making this a wonderful experience. Flying back you will fly right over the mountains, and will see Everest of course! Another optional side trip is to to fly to Jomsom in Lower Mustang, from where you can travel to Jharkot and Muktinath by horse or by jeep. 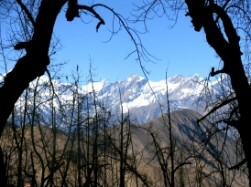 The altitude at Muktinath is 3,600 metres so you will see plenty of yaks and pack animals, many of which will have travelled overland from Pokhara. 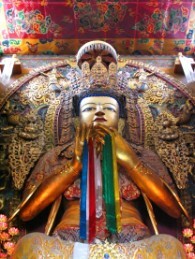 Although actualy in Nepal, the atmosphere here in Mustang is very 'Tibetan'. This trip is three nights at the end of your trip to Pokhara, then stay one extra night at Peace Dragon Lodge before flying back to Kathmandu for your onward journey home.